WASHINGTON, DC -- The US has accused Russia of deploying more air defence systems in eastern Ukraine in breach of a ceasefire deal. Pro-Russian rebels control large parts of eastern Ukraine. The state department also said Russia was involved in training separatist forces in the area and building up its forces along the border. The Kremlin has not yet responded to the claims. A truce between Ukrainian forces and pro-Russian rebels in east Ukraine was brokered by the West in Minsk in February. 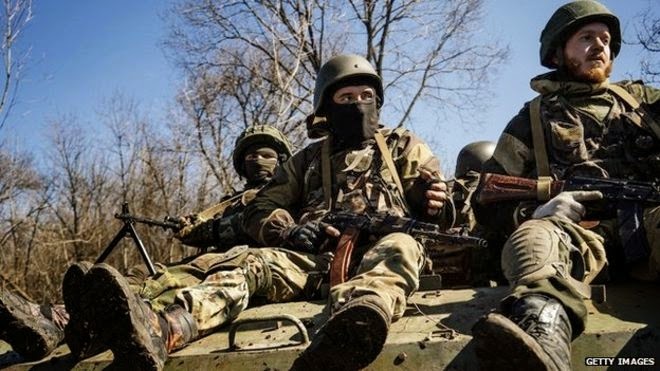 Ukraine accuses Russia of arming the rebels and sending Russian troops over the border - a claim Moscow denies. State department spokeswoman Marie Harf said in a statement that "combined Russian-separatist forces" were violating the terms of the Minsk deal, keeping artillery and multiple rocket launchers in prohibited areas. "The Russian military has deployed additional air defence systems into eastern Ukraine and moved several of these nearer the front lines," she said. "This is the highest amount of Russian air defence equipment in eastern Ukraine since August." Ms Harf said the "increasingly complex nature" of training of pro-Russian forces in east Ukraine "leaves no doubt that Russia is involved". "Russia is also building up its forces along its border with Ukraine," she said. "After maintaining a relatively steady presence along the border, Russia is sending additional units there. These forces will give Russia its largest presence on the border since October 2014." Earlier this month, about 300 US paratroopers arrived in western Ukraine to train with Ukrainian national guard units. At the time, Kremlin spokesman Dmitry Peskov warned the move "could seriously destabilise" the situation in Ukraine. One of the key points of the Minsk deal stipulates that all foreign armed groups, weapons and mercenaries should withdraw from Ukrainian territory. The UN says at least 6,116 people have been killed since the fighting began in the Donetsk and Luhansk regions last April - a month after Russia annexed the Crimean peninsula. Despite the ceasefire deal, sporadic exchanges of fire have taken place.